Earlier this month, Chinese handset maker Vivo launched the Vivo V11 Pro smartphone in India and now company has launched the toned-down version of the same dubbed as Vivo V11. The phone has slight differences as compared to Vivo V11 Pro, like the V11 Pro features an in-display fingerprint scanner, but the V11 features a rear mounted fingerprint scanner instead. However, the V11 also retains a few specifications. Let’s talk about the pricing before we discuss the specifications in detail. The Vivo V11 is priced at Rs. 22,990 and will be sold online exclusively via Flipkart.com and Vivo’s online store. In addition, the phone will also be sold via offline retail outlets across the country. The sale will begin from 27 September. It will be shipped in two colour options- Starry Night Black and Nebula Purple. The Vivo V11 sports a 6.3-inch Halo FullView FHD+ Super AMOLED display with 1080×2340 pixel resolution and 19:9 aspect ratio. As mentioned earlier, the display comes with a waterdrop like notch at the top similar to Vivo V11 Pro. It runs on Funtouch OS 4.5 based on Android 8.1 Oreo with the company’s Jovi AI Engine and is backed by a 3,315mAh battery with dual-engine fast charging support. Under the hood, the phone is powered by Mediatek Helio P60 processor paired with 6GB of RAM. The onboard storage capacity of the device is 64GB which can be expanded further up to 256GB using a microSD card. In the camera department, you get a vertically stacked dual camera set up on the back which is placed on the top left corner and comprises of 16-megapixel primary sensor + a 5-megapixel secondary sensor. The rear camera set up has LED flash support. The front hosts a 25-megapixel sensor for selfies and video calls. The camera also features AI Face Beauty, Live Photo, Group Selfie, AR Stickers, AI Portrait Framing and AI scene recognition. 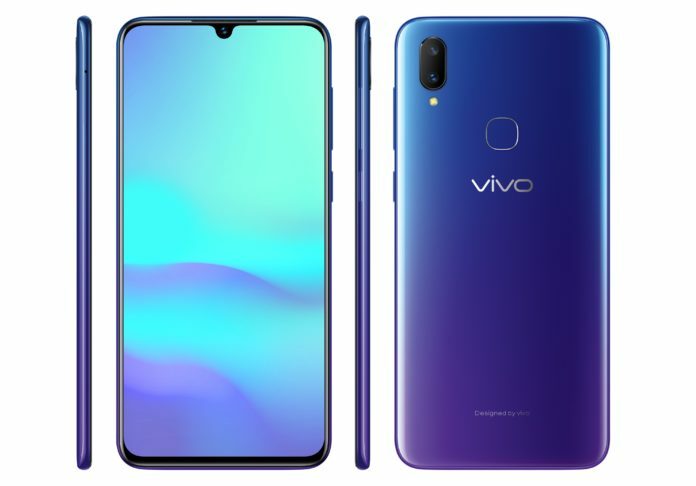 For connectivity purpose, the Vivo V11 features Micro-USB port instead of a USB Type-C port, Wi-Fi 802.11ac, 3.5mm headphone jack and Bluetooth 5.0. “At Vivo, it has always been our priority to bring constant innovation in technology and phone design. With the launch of the V11, we are adding a plethora of options for our consumers to choose a smartphone that meets their day-to-day needs,” said Jerome Chen, CMO of Vivo India while commenting on the launch of V11. Notably, Samsung touts that the V11 is part of the company’s ‘Make in India’ program.